Gum arabic/arabic gum (E414, also called acacia gum) has a complex molecular structure and mainly contains arabinose, galactose and glucuronic acid. It is a kind of natural plant gum condensed from the juice from the tree called Acacia-hence the name. Good-quality Gum arabic/arabic gum is amber in color, characteristic of large and round granules and mainly found in Africa. At present, Gum arabic/arabic gum in powder form after refining process appears and is therefore more convenient to use. Gum arabic/arabic gum is a kind of safe and harmless thickening agent and a gum formed by natural coagulation in the air. It is light yellow block or white powder and a kind of polyelectrolyte with molecular weight 220-300 thousand. By adding water, it will slowly dissolve into thick and tasteless thickener and the viscosity will decrease some time later. It is the genus Acacia legume and distributed in Pakistan, TaiwanIsland, tropical Africa, Arab and India. Now it has achieved artificial cultivation of introduced cultivars. Gum arabic/arabic gum is often used for the production of chewing gum, with favorable adhesion and soft elasticity, and the usage is generally 20-25%. It can naturally form knots on the bark, known as gummosis. If the bark is cut, the colloid will be produced to seal the “wound” and the process needs 3-8 weeks. Furthermore, the colloid is secreted from the stem of wattle and Acacia Senegal. There is original gum of hand-sort grade (HPS-4885), ordinary-level one (4885) and gelatin powder or crushed gum (kibble type) convenient for dissolution after industrialized refining and mechanical smashing processes. At present, more processing techniques can obtain the refined Gum arabic/arabic gum powder that can be directly used in food and pharmacy industry by means of dissolving the original gum first and then going through the processes of batch blending, screening, bleaching, sterilization and spray drying. The application of Gum arabic/arabic gum has a long history and Egyptians use it as the thickening agent in cosmetics and also in the mummification process. Gum arabic/arabic gum is the oldest and most famous natural gum in the world and its earliest application traces back to Ancient Egypt 5,000 years ago. At that time, it had been used and as time went by, it had a wider application, especially in food additives. For example, it can act as the emulsifying agent in beverages, food adhesive and coating in candy and chocolate to enhance the mouth feel and prevent sedimentation. In all, it has dozens of uses. Especially since modern people have strict demands on the food health, natural botanical Gum arabic/arabic gum contains a large amount of dietary fiber and meets the requirement of healthy food. Moreover, the property of high dietary fiber enables it to be a good additive ingredient of modern food. 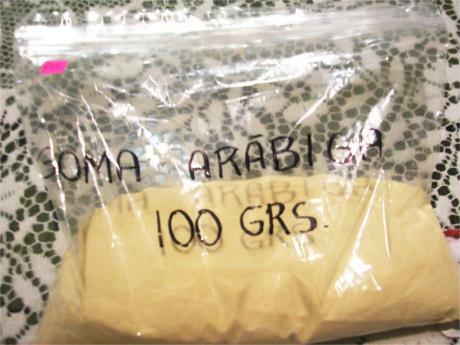 Gum arabic/arabic gum is often used to make powdered oils and usually with gelatin together. Since it has favorable water solubility and emulsifying property, it helps to improve the microencapsulation efficiency of embedded substance in the embedding process. When Gum arabic/arabic gum meets carbonated beverage containing carbonate, it will be easier to achieve the breakthrough in the surface tension of water molecules, releasing more carbon dioxide at an alarming rate. Since the reaction is violent, take care when drinking and protect yourself from getting hurt. Gum arabic/arabic gum was once a kind of hydrosol with the widest uses and the largest consumption in the food industry and now the worldwide annual requirement for it still remains 40-50 thousand tons. Gum arabic/arabic gum can also be widely used in beverage production. For example, it helps to stabilize the flavor and essential oil in the production of soft drinks or concentrated juice. Gum arabic/arabic gum is a kind of carbohydrate polymer and can be partly degraded in the large intestine. It enables to supply the human body with fiber and its energy value is less than half that of starch and maltodextrin. More specifically, Gum arabic/arabic gum is the compound of Arabic galactosyl lactose, polysaccharide and proteoglycan, with very high solubility. With favorable emulsifying property, Gum arabic/arabic gum is particularly suitable for emulsification system of oil-in-water type and widely used as emulsion stabilizer in the emulsion flavor. Besides, it also has good film forming property, so it is widely used as microcapsule film-forming agent in the transformation process of essential oils or other liquid materials into powder form to improve the flavor quality and to prevent oxidation. It also acts as the essence carrier of baked products. 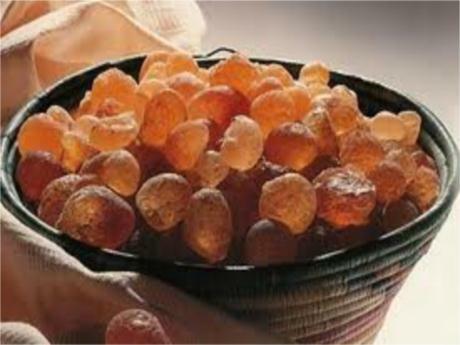 Gum arabic/arabic gum helps to hinder the formation of sugar crystals, so it can be used as the anti-crystallizing agent in candies to prevent crystallization. Furthermore, it can effectively emulsify milk and cream in milk candies to avoid overflow and in chocolate, it is used for surface glazing to make chocolates melt only in the mouth but not in the hand. In carbonated beverages like cola, Gum arabic/arabic gum is used for emulsification and dispersion of essential oils and oil-soluble pigments to avoid pigment circle appearing at the bottleneck, which was caused by the floating of essential oils and pigments during storage. In addition, Gum arabic/arabic gum can be used with plant oil and resin together as the blushing agent to increase the appearance diversity of drinks. In terms of nutrition, Gum arabic/arabic gum generates no calorie on the whole, and is a kind of favorable water-soluble dietary fiber, so it is widely used in health care products, candies and beverages. In medicine, it also plays a role in lowering blood cholesterol levels. Gum arabic/arabic gum can also be used in many other industries. In conclusion, its application in the food industry can be summarized as natural emulsion stabilizer, thickening, suspending, adhesion and film-forming agents as well as water-soluble dietary fiber.